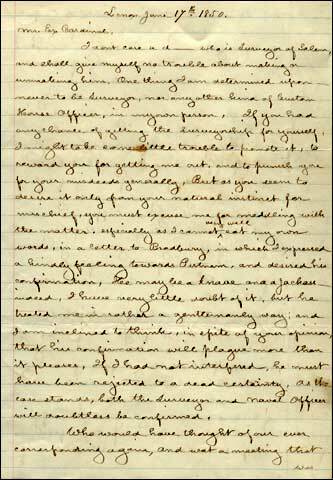 Page one of a copy made by George B. Curwen of a letter from Hawthorne to Horace Ingersoll written in Lenox in the summer of 1850 about his firing as surveyor at the Salem Custom House the year before. On the first page of this letter to Ingersoll, Hawthorne calls Putnam (who is appointed to take Hawthorne's place as surveyor) a "knave and a jackass" but says that even so, Putnam treated him in a "rather gentlemanly way." Ingersoll sold the original letter for one dollar to Curwen who made a copy of the letter for Ingersoll. This copy was given to George H. Holden by Ingersoll. Holden records this information on a note attached to the end of the letter dated March of 1896, Providence.